The Craziest Cosplay from Gen Con 2015! The biggest tabletop gaming convention in North America keeps setting attendance records, and cosplayers show up in full force. This year, hundreds of gamers put on their fantastic finery to show off favorite characters and original creations, and we’ve got the greatest and weirdest for your perusal. 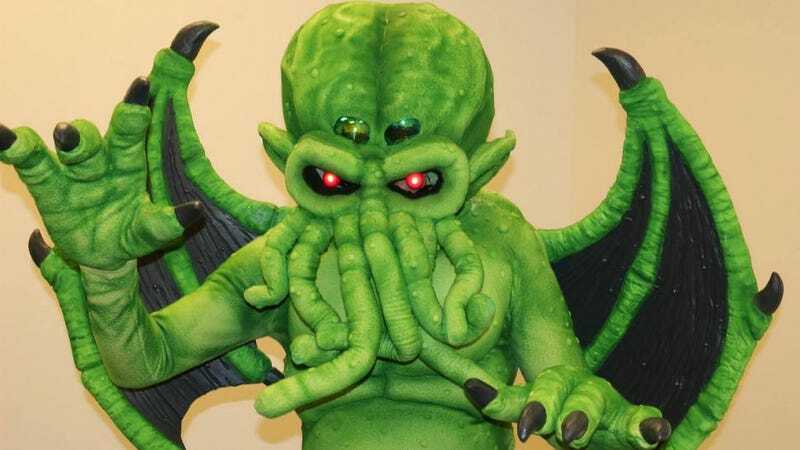 The custom Cthulhu costume above was made for retro action figure kingpins Warpo, who had the Dreamer in the Deep hanging out at their booth throughout the con. I always get wrong which far future grim/dark miniatures game is being cosplayed, so I’ll just wait for someone in the comments to clue me in. Killer costume, though. [Black Templar Space Marine from Warhammer 40K]. Pugna from DotA. Wow. (Correction, it’s apparently Thresh from League of Legends). That is a whole lotta Sauron. I seriously just want to party with this guy. Meme cosplay holds a special place in my heart. I went as a barbarian one Halloween, back when I had long hair. I did not look this awesome or badass. I don’t think I’ve ever seen a Black Manta cosplay before. Some day, when elves and goblins finally live in peace and harmony, we’ll look back on this historic meeting. I’ll bet you didn’t know Indianapolis’ convention center is the Nexus of All Realities. Red Owl Photo does green screen photos for cosplayers at conventions—you’ll find them at most cons in or near Chicago. Here’s their some of their Gen Con work! The whole family cosplaying together just warms my bitter old heart. The costumes are great, but I don’t... I mean... let’s just have a caption contest. No prize. WWII Bombshell Harley Quinn, and now I really want someone to paint Harley nose art on an actual vintage bomber. There’s some really cool detail going on with this costume. There are a million “Deadpool acting silly” cosplay photos, but this one might be the greatest ever taken. Do the voice. Come on, do the voice.